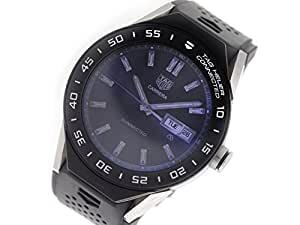 Watch Information: Brand: TAG Heuer Series: Connected Modular 45 Model#: SBF8A8001 Gender: Men’s Box/Papers: Gift Box, 2 Year Store Warranty Case Information: Material: Titanium Finish: Brushed & Polished Caseback: Titanium Diameter: 45mm Thickness: 13.75mm Bezel: Fixed, Black Ceramic Crystal: Sapphire Scratch Resistant Crown: Push Button Water Resistant: 50m / 165ft Movement Information: Movement: Rechargeable Quartz Battery Functions: Hour, Minute, Second, Date, Chronograph, Alarm, Touch Screen, Microphone, Proximity Sensor, GMT Dial Information: Dial Markers: Digital Dial w/ Amoled Touch Screen Display Bracelet Information: Band: Black Perforated Rubber Strap Clasp: Titanium Dual Push-Button Foldover Deployment Length: Will Fit Up To a 8.25″ Wrist, Adjustable Features: Warranty: 2 Year Precision Watches & Jewelry Warranty Key Features: Rechargeable Quartz, Intel Atom Processor Z34XX, Smart Watch, Titanium, Ceramic *****Please note that year of watch listed is an estimation only*****. Buy with confidence knowing each timepiece goes through the same rigorous 31-point inspection. Rest assured only authentic parts straight from the manufacturer are used. The Certified Pre-Owned Program on Amazon ensures peace of mind and transparency via standardized reports and a 1 Year Warranty Provided by WatchFacts.